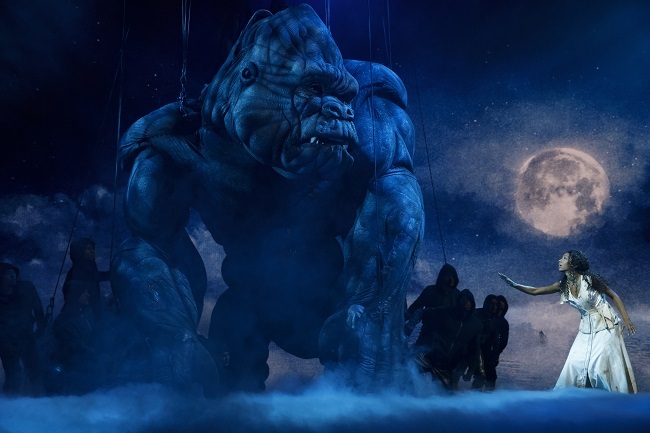 One of cinema's biggest, most enduringly popular beasts is making his unexpected debut on the Broadway stage this month. No, I'm not referring to Duane Johnson but rather King Kong, the massive simian ruler of Skull Island. Kong first appeared on movie screens way back in 1933 and has reigned over sequels and remakes ever since. When I first heard he was to be the star of a theatrical musical, I scratched my head like many naysayers but I was also intrigued. So intrigued was I that I set out to make King Kong, which opened November 8th, the subject of my first official Broadway review since moving to the east coast! 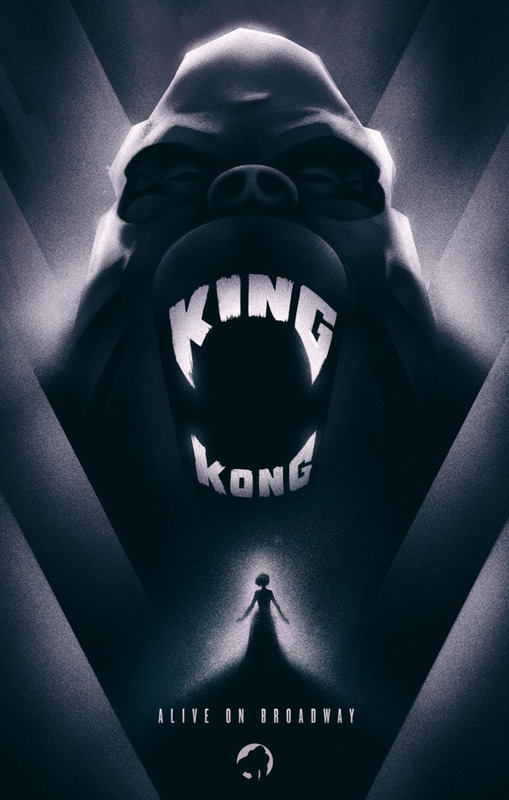 Although this production actually originated in Australia, it is most fitting that it is having its American premiere in the city Kong has terrorized repeatedly. The book, written by recent Tony winner Jack Thorne (Harry Potter and the Cursed Child), is set in Depression-era NYC just as the 1933 and 2005 movies were. It follows the original plot's basic outline but makes some striking changes with the lead human characters. Carl Denham, the charmingly reckless filmmaker, is now a full on villain with little regard for his leading lady, Ann Darrow, Kong or anyone/anything else. Ann, meanwhile, is no longer a wilting flower scream queen à la Fay Wray but a newly empowered heroine for the #MeToo generation (she is also currently being played by a black actress, Christiani Pitts, making Ann even more relevant in 21st century USA). Denham, Ann, and a hunky all-male crew journey to Kong's home via a spectacular evocation of a sailing tanker courtesy of scenic and projection designer Peter England. Once there, the original tale's gorilla-worshipping natives are replaced by mysterious sentient plant life, which is initially confusing but explained later in Act Two. 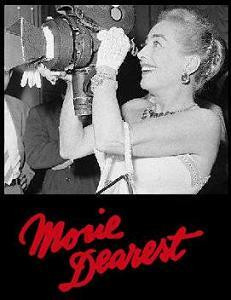 These crafty vines "kidnap" Ann and present her to the larger-than-life master of Skull Island. The genuine thrills of this stage adaptation of King Kong are provided by its title creation: a 2,000-pound, two-story-tall, absolutely-believable puppet designed by Sonny Tilders and operated by ten cast members dubbed the "King's Company." It roars, it carries Ann in its fist, it "runs" through the jungle, and it convincingly climbs the Empire State Building (uniquely viewed from within the tower). At one point, when Kong breaks free from his theatrical captivity, it even moves down to the first view rows of the audience and "sniffs" patrons before roaring at them. The audience responded with wild applause to practically every gesture and facial expression of this marvelous faux monkey. 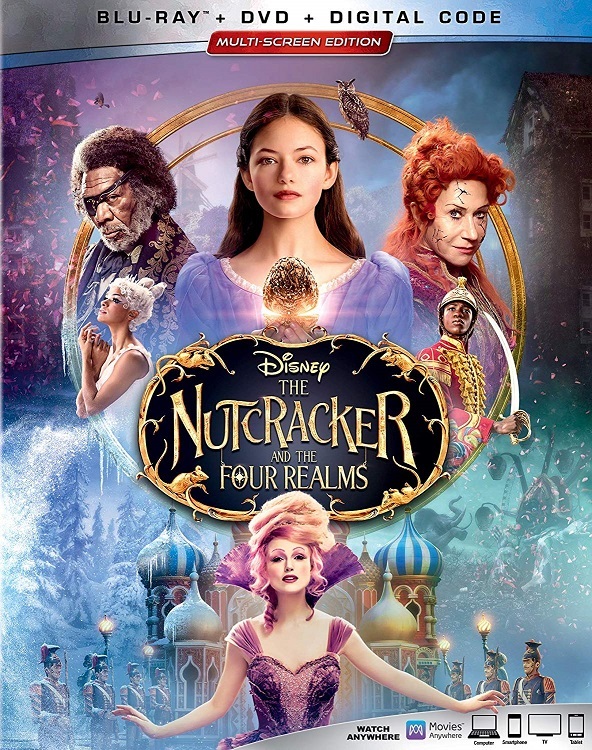 One does wish the musical's book was stronger and its songs more memorable but it is hardly "The Mess That Roared," as it was recently dubbed in a merciless New York Times review. The techno-pop score by Marius de Vries (of Moulin Rouge! and La La Land fame), Eddie Perfect (who will soon also be represented on Broadway with the new musical version of Beetlejuice) and a handful of other contributors features a few numbers that are catchy, moving, and/or hilarious (intentionally so). The most touching and memorable of these is one of the simplest: a lullaby Ann sings to the wounded Kong while a full moon casts its light upon them. 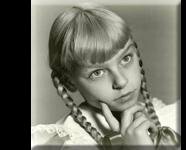 Ann gets a couple of powerhouse songs including "Last of Our Kind" but the climactic "The Wonder," sung by the entire cast, is genuinely spine-tingling. Director-choreographer Drew McOnie puts his predominantly male cast through some dazzling paces. The fluidity not only of the dances but the show as a whole is truly impressive. The handful of female performers are fine in largely chorine roles, and several of them nearly steal the show away from Kong when they are forced to sing while the monster is breaking free. Pitts is fetching and in command as Ann, the queen to Kong's king, even if her character comes across as too contemporary at times. As the conniving Carl, Eric William Morris has charm but is saddled with a pretty one-dimensional role and isn't given much to do musically. Veteran actor Erik Lochtefeld is affecting as Lumpy, a new character with a tragic backstory. And ensemble member Casey Garvin is a standout as "Fake Carl" in the show-within-a-show relating the story of Kong's capture. Garvin is handsome and hilarious, and the unknown woman sitting next to me concurred that he is this production's best asset after the Kong puppet. 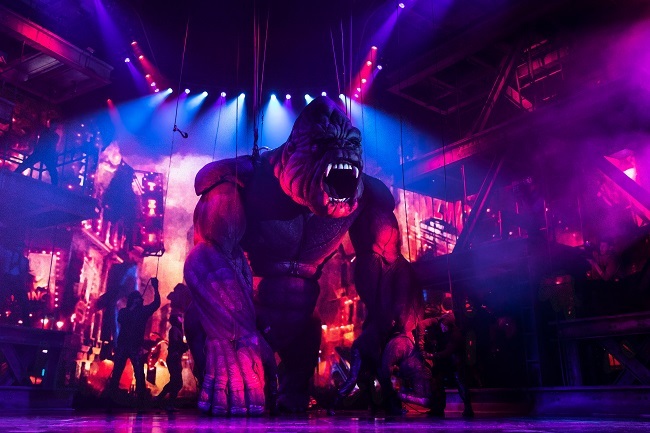 It is difficult to predict the longevity of the stage version of King Kong, given the mixed critical reaction it is receiving plus its enormous scale and related cost. There is no question, though, that it is the best giant-monster musical out there... at least until a Godzilla tuner comes along.